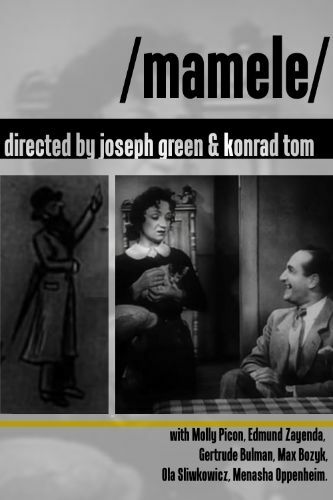 The always-delightful Yiddish stage star Molly Picon heads the cast of the ethnic musical comedy Mamele. The title translates as "Little Mother", a perfect description for young Chacchi (Picon), who takes care of her two sisters and widowed father. Unappreciately by her boorish family, Chacchi seeks out happiness elsewhere, leading to her loved ones' realization that they can't get along without her. The material was old hat even in 1939; indeed, the film was a remake of a 1926 Picon vehicle. Still, the project stays afloat on the sheer charisma of its effervescent star, whose song numbers are the film's uncontested highlights. The only unhappy aspect is the viewer's after-the-fact realization that the colorful Jewish lifestyle depicted in Mamele was doomed to extinction at the hands of the Nazis.